Italian Greyhound Puppy Information " "
Want a people-oriented pooch descending from a lineage of hunting dogs yet affectionate & playful but does not yelp a lot? Then an Italian Greyhound puppy may be a good choice. Offhand, this breed of dog can look fragile in a sleek and elegant kind of way. Italian Greyhounds are sturdier than what most people make them out to be, though. There are actually many reasons why they make great pets. For one, an Italian Greyhound puppy is a very minimal shedder, and possesses a smooth coat that’s easy to care for. The pup is prone to dental disease. 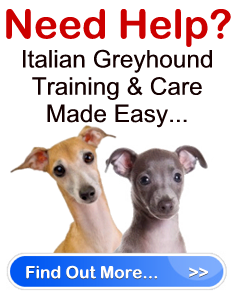 Its not surprising to find such an Italian Greyhound pup developing gum disease upon reaching the age of one or two. Hence, professional cleaning by a vet and good products like natural dental chews that can do a good job in preventing tartar build-up can help a lot. Pet owners can also use a microfiber finger brush to clean the dogs teeth. As for the ears, a cotton swab or doggie wipes can be used to remove waxy build-up, which the Italian Greyhound puppy can be prone to owing to its floppy ears that inhibit air circulation. Italian Greyhound pups need weekly toenail trimming, so be if you cant do this for your pet, be prepared to visit the pet groomer regularly. A clean, odorless and energetic Italian Greyhound can be a joy to have around the house. Just don’t leave the pup alone with kids unsupervised. Other characteristics of the dog are its clingy nature; the tendency to roughhouse with other animals and to keep jumping off furniture; and the almost human-like quality of being sensitive, especially when scolded in a reproving tone. As with all dogs, its best to train the Italian Greyhound at an early age. The pups respond well to owners/trainers with an air of natural authority. The dog breed is known to be difficult to train, but consistency will pay off. You just got to teach the dog who is the pack leader. To ensure a healthy & happy Italian Greyhound puppy, regular exercise to let the pooch vent energy is a must. The pooch may not be able to outrun the Greyhound, which has greater stamina. In any case, the Italian Greyhound can be a fast sprinter. By giving your Italian Greyhound pup room to move, quality chow, proper training and the minimal grooming required, you can create a harmonious and rewarding relationship with the pet.